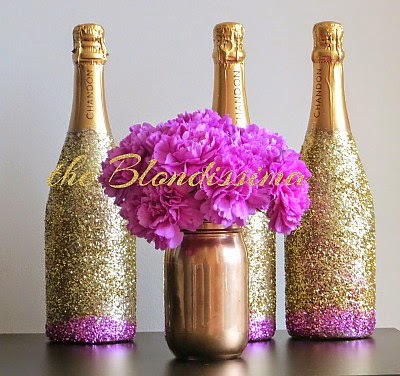 I've seen these glitter champagne bottles all over pinterest and knew immediately that I wanted to try it! I like my champagne sweet and used the same ones I had at my Golden Globes party. 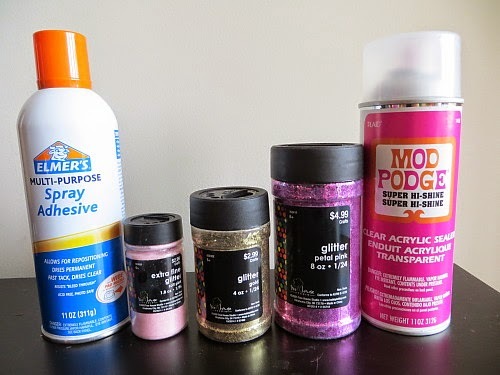 Then I went to Hobby Lobby to pick up all of my supplies: Copper Spray Paint, Spray Adhesive, Glitter and Modge Podge Sealer. 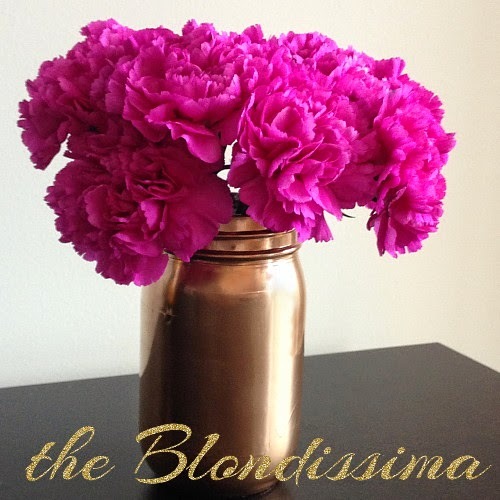 For fun I also sprayed a mason jar to create a nice vase. 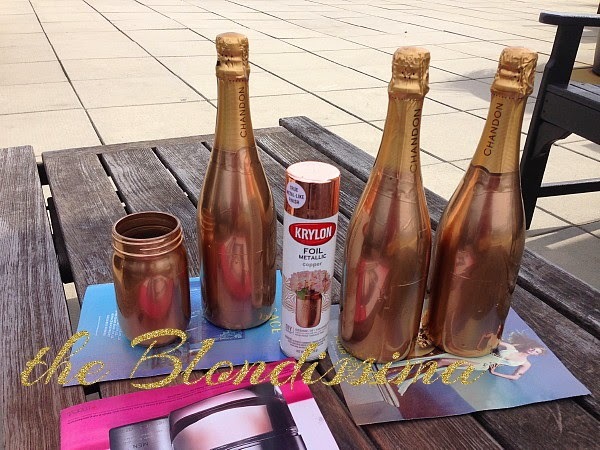 Step 1: I went outside and used Krylon's copper foil metallic to do a base layer on my bottles. I did this so that in case the glitter doesn't coat evenly or if it sheds at some point, that background color will show through instead of the bottle itself. 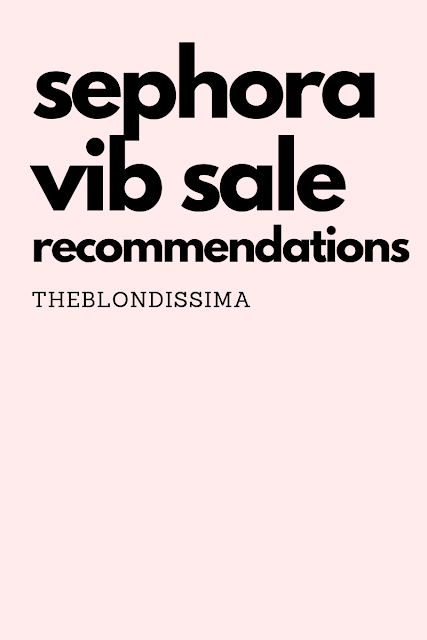 I week later I had a snow day on Saturday and got very productive at home since I had a touch of cabin fever and continued on my fun DIY project. 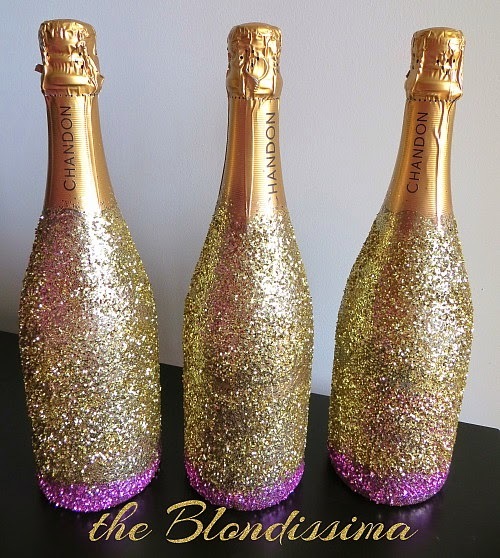 You can cover your bottle with just one color of glitter or do a multi color ombre. Step 3: Shake up your spray adhesive and spray your bottle in sections according to how many colors you're using. I started spraying the top third of the bottle, keeping clear of the cork because you need it as a handle. Step 4: While rotating the bottle, sprinkle glitter over it. Give the bottle a little shake to shed any excess. Then repeat, spraying sections with a tiny overlap as you continue to shake your progressive shades all over that bottle. Step 5: The final step is to seal the glitter on the bottle so it doesn't shed later. I did two layers with 10 minutes drying time in between. The Modge Podge acrylic spray is non-yellowing and doesn't dull the sparkle and shine. Love how this fancies up a simple bottle so easily! Those are fantastic and so sparkly and wonderful! I love it. What a great idea!! Those look like so much fun! Glitter makes me happy! Yes they are still full. What a great idea! I love anything sparkly. These are awesome!!! 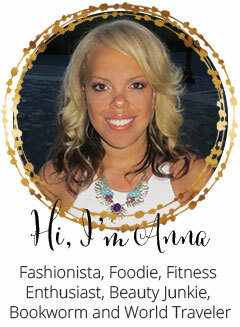 So fun and sparkly!! Wanna make me some!?!?! HA! These are adorable! I'm going to share this post with my daughter.It's right up her ally! The bottles seem to match you perfectly...and I don't even know you that well! lol! How fun! They turned our beautifully!